Valentine’s Day is right around the corner. I’ve never been one to make a big deal of the holiday from a romantic standpoint, instead, I use it as a time to show love to my friends and family. Since food is how I most often show my affection, it should come as no surprise that I like to give my friends homemade treats for Valentine’s Day. Edible gifts are my favorite gifts to give because I can almost always guarantee that they’ll get used. Since there is plenty of chocolate available this time of year, I thought it would be fun to branch out with a different kind of sweet to share. Infusing honey is something that I’ve wanted to try for a while, and Valentine’s Day seemed like the perfect excuse to do it. It’s still bitterly cold here, and chocolate isn’t the best thing to enjoy while sitting in front of the fireplace, you know? A mug of hot tea, though, is great for sipping in front of the fire. Even better when it’s made with a touch of this infused honey. The flavor combinations for infused honey are practically endless. I made both lemon-rosemary and vanilla bean-cardamom. The lemon-rosemary is stronger in flavor because the herbs I used were crushed, but I like the intensity of flavor. Eric described this one as a really tasty version of a Ricola cough drop and thinks it would be perfect in a Hot Toddy. I think it would be perfect in any tea, especially if you’re feeling under the weather. The vanilla bean-cardamom honey has a more delicate flavor, and I think it works in many uses – drizzled over a slice of quick bread or a cup of yogurt, as part of a cheese plate, mixed into tea or coffee, used to sweeten a smoothie. As you can see from the photos, I left the cardamom pods and vanilla bean in the jar. I thought they were beautiful, and there’s no chance of them over-infusing before I use up all the honey at the rate I’m using it. 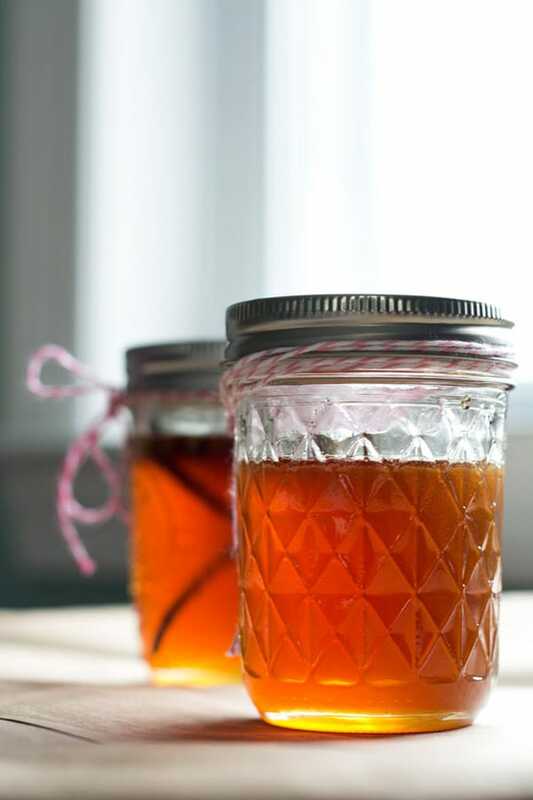 To turn this honey into a sweet gift, just tie a bit of twine around the jar and add a label if you like. You could even tuck a small jar into a mug with their favorite tea or include a miniature loaf of quick bread to make it extra special. Use local honey if you can find it, and try out different combinations of herbs to find your signature flavor. Place the herbs in a jar with a tight-fitting lid, then pour the honey over the top. Use a chopstick or skewer to stir the honey, then top off the jar with additional honey if needed. Cover the jar and place in a pantry or cabinet for 5-7 days. Crushed herbs will infuse more quickly. You can achieve a stronger flavor by allowing the herbs to infuse longer. Occasionally turn the jar over to keep the herbs well coated. When your desired flavor is reached, pour the honey over a fine mesh strainer to remove the herbs. Slightly heating (I microwaved mine for about 15 seconds) the honey immediately beforehand will help this go more smoothly if your herbs are very fine. What’s your favorite edible gift to give or receive? My daughter and son-in-law gave homemade vanilla for Christmas presents. Everyone loved it! I’ve bought infused honey at the farmer’s market before, but I’ve never thought to make my own. Vanilla Bean Cardamom Honey sounds incredible! Great idea! But I’d recommend not microwaving the honey. You want to zap all those delicious health benefits?? Good point! I didn’t even think about that. This looks like an excellent gift to have on hand for winter colds. I’m delighted that I found this now, while I’ve been emptying canning jars each week! Love infusing honey with herbs. Yum! Thanks a bunch for sharing. I shared this on my G plus! Have a good and Godly day! I left the cardamom and vanilla in there for 3 weeks – it came out with fantastic flavor. BTW, microwaving the honey won’t “zap” it if you don’t get it scalding hot – just get it warm enough to flow through a strainer. (The enemy is heat, not microwaves per se, plus, if you’re using commercial pasteurized honey, it’s already been cooked.) I made up a big batch – 12 jars – with 9 lbs of honey from a local beekeeper, and kept the spares in the freezer until I needed to open one. (Or give one as a gift – it’s easier to do if you’ve got plenty! Do it in the fall, and you’ll have honey for Christmas gifts.) Freezing, counter to what you might expect, slows down crystallization.